Now listen, share, and discover new music with your friends on Facebook for free. Just like Spotify in US, Facebook has partnered with Indian popular music streaming radio service Saavn to bring the Indian music, Bollywood and regional South Asian music to the social network. Saavn (which stands for South Asian Audio Video Network) is the fastest-growing music service for South Asian music, worldwide. They have around millions of tracks, licensed from hundreds of labels – so whatever you want to hear, you’ll always find it for free (and 100% legally) with Saavn. They have a great collection of licensed music from over 200 content provider. Saavn makes money via targeted display and rich media ad units for global advertisers. According to TechCrunch, the integration began in December and by the partnership they have already brought more than 7,00,000 new Facebook users to the Saavn network. With Saavn on Facebook, your friends’ music activity shows up realtime on your Ticker, News Feed, and Timeline, so you always know what your friends are listening to. Best of all, you can hit “play” on any of these Saavn stories and instantly discover great new music. 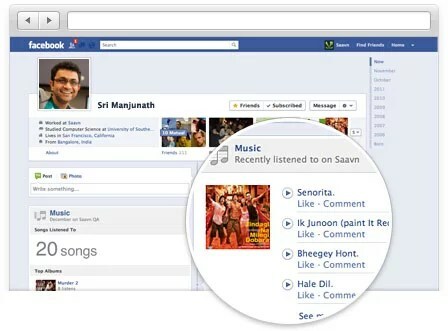 Saavn and Facebook lets share music with your friends, simply and on the go – no clicks required. Express yourself with songs on your Timeline or shout out friends with dedicated playlists. Your music can be part of the conversation. Saavn allows users to stream music online through web, on mobile wherever you go (they already have Android and iOS app)and also allows to create and share playlists with friends. There is also a premium version, for which users pay and they listen music service offline. Saavn also allows users to create radio stations like Pandora, where the service delivers music based on users preferences using algorithmic similarities. In its first four weeks as a Facebook Open Graph partner, daily new users of the Saavn Facebook application increased up to 40 times, with music shares increasing four-fold and monthly active users jumping from 35,000 to 785,000. Unlike other music service Saavn has license to stream music globally, so users representing 219 countries can use to listen and share the contents. Have you tried? Do comment your feedback using it.